Perfect for Ohanami (Sakura viewing) Bento!!! 1. Mix chopped Umeboshi in the rice and divide it into 10 portions. 2. Cut Nori sheet into half, then cut into 3 pieces. Make 10 of them. 3. Place Umeboshi rice on the Nori sheet, then wrap to make thin rice rolls. 4. 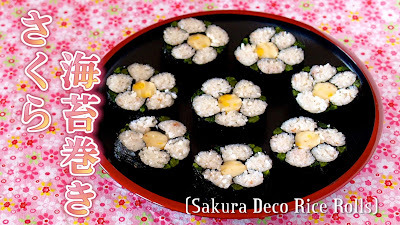 Place a bamboo sushi-roll mat on your hand, place 3 thin rice rolls, place Chee-Kama (cheese fish sausage), place 2 thin rice rolls, then shape them into a flower shape. 5. Cut Nozawana into the length of a Nori sheet, place them between the thin rice rolls. Cut Nori sheet into half, then securely wrap the flower roll. 6. With a moistened knife, cut the roll into 4 pieces (re-wet as needed. don't push but pull to cut).